Tell noisy visitors to "knock" it off! Ten winners! Now you can keep the doorbell silenced with your own Knock Nanny! 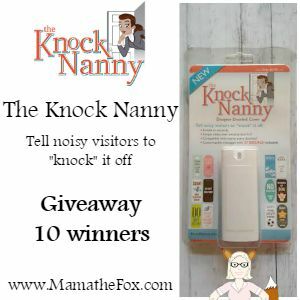 The Knock Nanny is a super durable and weather resistant piece of plastic that can slip over your doorbell to stop visitors from ringing that bell. You can choose 1 of 27 fun decals for your Knock Nanny to display the message which fits your household. Read the full review here! This giveaway is hosted by MamatheFox. MamatheFox is not held responsible for sponsors who do not fulfill their prize obligations. If you would like a review & giveaway like this please contact mamathefox @ gmail.com for more details. This is such a great product . Wish I had this when my seven were babie. Thanks for the giveaway.